Christian Singleness. Even saying it makes you cringe right? There is so much stigma surrounding singleness in our culture: if you're "secular" and single---it's great and you are pretty much given a free pass (unless you happen to be Prince Harry. Ahem.) If you're Christian and single, and "of marriageable age," (whatever people seem to think that means these days) they are constantly asking you if you have a boyfriend/ring/wedding date yet. This is where (in)Courage Community sessions step in. 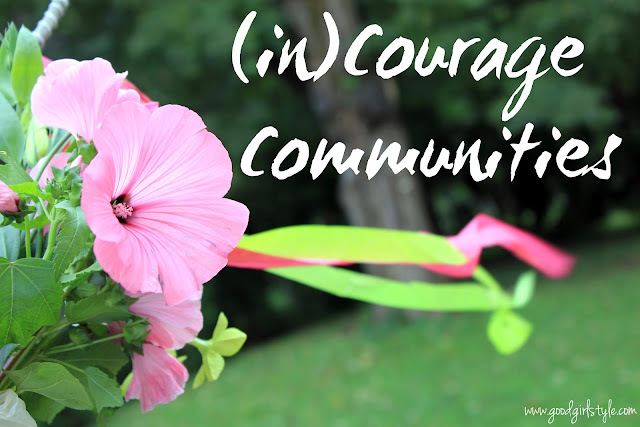 (in)Courage is one of the ministries of DaySpring, and they rock! They are starting a series of 40 community group sessions on different 'seasons' of life, different journeys and places along the Christian road, and asking leaders to encourage others along the way. They paired me up with Julie. Julie and I...well, we're single girls, and we have been for awhile. We're different ages and stages in our own lives, and we live on opposite sides of the country. But we're hoping to build a community of like-minded women who want to approach Christian single-ness, not on tiptoes around stigma, but by embracing it with a heart of compassion and purpose. We understand that this season--it isn't just a season of waiting. Yes, we wait, but we are also preparing, growing, encouraging, and...working on contentment. We're single. But that doesn't mean we have to be lonely, hurt, jaded, bitter, unhappy, stagnant, waiting for life to begin, or any of those things. God still works in single people's lives, friends. God still gives us tasks to accomplish, people to love and nourish, lives to build into...he gives us tough lessons to learn and he gives us MANY, MANY blessings. We're here to encourage each other in this time. Let's make it a fruitful time, so that we aren't wasting it wishing and waiting. We can wait purposefully and with intention. The first session runs October 2nd-December 2nd and doesn't require any commitment from you. That just means that Julie and I will be actively participating in our group, offering encouragement in our unique ways, and seeking to connect with you. This is all so exciting! Psst....If our group/season of life isn't the one for you, find the rest of them here!